I’m often asked by students, “what’s a good light kit for starting out” and I find it a very hard question to answer, because it really depends on what you want to do. There really is no such thing as a one-size-fits-all one case light kit. I find that most of the commercially available light kits I’ve seen offer too many watts and not enough versatility. After years of creating a variety of make-shift kits from my lighting collection for particular shoots, I’ve settled on one configuration when I’m “traveling light,” and I think the best approach is to put together a custom kit that meets your personal lighting needs. Expendables (gaffer tape, C-47s, black wrap, trick line, and assorted gels and diffusion including half CTB and CTB sized with holes to fit the Rifa light). This kit has worked out well over the course of over a dozen interviews since I put it together. It originally started out in a larger Pelican rolling case with additional instruments, but that quickly got the nickname “the beast” and I eventually trimmed down to the configuration above. The Rifa LC-55 (500W) produces just enough light for most situations, and it’s the right choice for a lightweight and compact kit, however, if I could spare the space and weight, I’d rather be using a Kino Flo Diva-Lite. I’m considering adding to the kit (I still have a little room left in the case) one or two LED lights. These offer the advantage of small size and practical battery operation. I’m considering the Zylight Z90 (total creative control in terms of color and wireless control, however, a tad pricy) and the Lowel Blender (more affordable than the Z90, however, not as versatile as the Zylight). Back in July, I posted a comparison of four LED lights summarizing the results of my research. Special thanks to Joseph Ingoldsby for asking the question that resulted in this post. 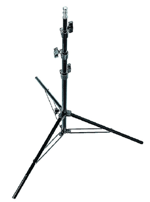 Update, July 15, 2010: The Avenger A625B Light Stands are no longer available, a reasonable replacement with a new stacking feature would be the Manfrotto 1051BAC Light Stand, Black – 6.75′ extended and 26″ when closed, not quite as tall as the older stands but for a portable kit, the stacking feature means they will nest more snugly in the case. — David. Update, December 29, 2011: If I had to do it all over again, I’d get the Lowel V-Lights instead of the Totas, but I purchased the Totas long before the V-Light existed. I’m also thinking of adding one or two 150 W Arri Fresnels to the kit as accent lights along with replacing the cords on all the Arri’s with smaller cords that will fit better in the case. Some LED lighting is also on the horizon as costs come down. — David. Ozair, you can purchase these items from a wide range vendors, check in your local area first (e.g. in Boston we have vendors like The Camera Company and Barbizon Light from which we can buy lighting gear) or for online purchasing, try B&H Photo/Video in New York. How do you guys show your movies to people ? Great piece of advice. I’ll take a closer look at that list of items. Dave: when I left CDIA I took your advise on lighting, and it’s worked well. Now with 4 years experience and 75 interviews in 2010 I have a few suggestions about lights to travel. Get a 1K LED rather than a softbox ($400). 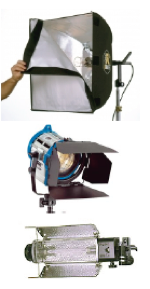 We use ours in preference to both a Westcott Spider light & a 650w Arri with softbox. if you’re flying, this light in it’s briefcast like case can be carried on as well as the Portabrace bag holding your camera and it’s all you need for a simple shoot. If you’re driving, you can carry more cases. Our light kit, in addition to the LED is: 650w Arri, 300w Arri, Spider Light, two Tota’s and they all fit in a 3 light Arri wheeled case with the stands, scrims & gels. 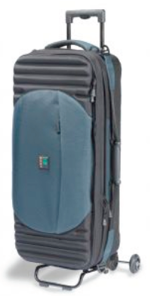 We tried the one case solution for three years, and it didn’t work well, or at all when you fly. Dave, The amount of light output you get with a 500W Rifa is far greater than any $400 LED light. To equal the output of a 500W Rifa light you would have to spend well over $1,000 at this point in time, and the quality of the light is very different. I love LED lights, and have spent time using Lite Panels 1x1s, Zylight Z90s, and the wonderful new Blender, but I’m not ready to pack in the 500W Rifa soft box yet. I often supplement this kit when I’m not flying with an additional Tota light and a second 300W Fresnel. There is no LED light that can replicate the quality of a Fresnel at this time either. Lighting is like cooking, it’s very subjective and everyone will find the recipe that works well for them. The final results are what counts, and I’m very happy with what I’ve been able to accomplish with this one case kit when I’m flying and only want to carry one case of lights. Your mileage, of course, will vary. Excellent…very good infomation for student or working pro. I struggle with keeping my kit at a reasonable size. I like a cookie on the background and that means an appropriate light, cookie and stand. Just more to carry! Just bought a Blender and really like it! Kevin, glad to hear you like the Blender, it’s certainly a wonderful problem solver that is small enough it can be added to most any kit! I wrote in an earlier comment, “There is no LED light that can replicate the quality of a Fresnel at this time either,” however, it looks like this is about to change, check this out this product brief: Litepanels introduces Revolutionary New Sola Fresnels. I look forward to taking a look at these, and hopefully they will have a nice small “ENG” edition. We’ll see. Lighting I feel is probably one of the most overlooked aspects of filmmaking today. Yes it is possible to work with the lighting in post production but having the right lighting during filming can make all the difference. A movie can have a whole different look and feel to it depending how the lighting is set up. This lighting kit looks like a great kit for a filmmaking beginner.